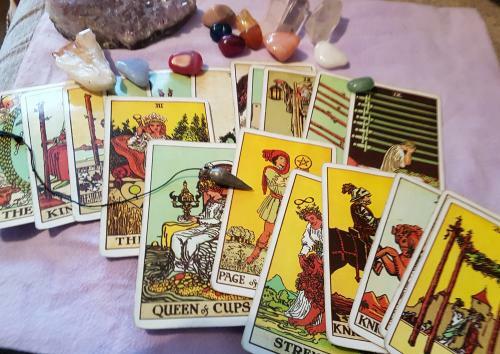 Psychic clairvoyant tarot reader, pendulum and tarot cards. Hello my name is Sara A, and I work with my spirit guide Chief Running Bear who is a Native American Indian, he was my brother in my last Native American life. I am a direct reader and a compassionate person and read with empathy, I specialise in love and relationship readings and enjoy giving an uplifting reading to help people continue on their path in life. I connect to the energy of the people that I read for; I’m non-judgemental, very down to earth and caring. I am also a reiki healer and offer healing to anyone that needs it. I enjoy helping people from all walks of life move forward with their lives, empower them and uplift them, and I look forward to reading for you very soon. I love to give positive readings and help people see the light at the end of the tunnel, every reading is different as such is every person, and I make my readings personal to that person. My aim is to leave you feeling positive and happier then when you started the reading, and giving you the power to move forward on to a brighter future. Seeing clients taking back their own power and changing their life is fantastic to see. I think I am a typical Piscean, warm friendly and compassionate I like to every one as much as I can with no matter what the problem is, there is always a solution to the problem. I have a great sense of humour and enjoy a good laugh, but also at the same time I am sensitive to people’s feelings and emotions. Round about the age of 14 I think it was, when I was at home with the family, I told my mother that the phone was going to ring. The phone did ring and as she walked past me she looked at me in an odd way which I laugh about now, I never knew who was on the phone, she did ask me on her return who it was and I said I have no idea, as I never answered the phone! I used to have a lot of dreams where things happened and this became like a warning system, and the things I saw in those dreams would occure within a few days this continued into my late 20's then settled down to be not as often as they used to be. From that moment I just seemed to know things, but never really knew where that information came from, until years later when I kept seeing my guide in my dreams and the bear and wolf he brought with him, then the jigsaw started to fit together with my love of wolves and Native American flute music. I always knew when something was wrong with someone before they even spoke, walking into a room I could pick up on the persons feelings before they even spoke to me. The one that stands out the most from all of them was a young lady, who was very worried about getting a job, her contract was coming to an end and she was applying for hundreds of jobs a week. I kept reassuring her that no matter what she would have a job before her contract ended, and by the skin of her teeth she landed a job 10 days before her old one was due to finish; the relief for her was amazing. Life brings us many changes, and along the path lessons are learned, I think over the years I have learned many and seen a lot, I am a very spiritual person I am a practicing pagan, and currently doing more work with the magic of crystals. I care for everyone that I meet, and those that are in pain of any type I am just drawn to helping them, just my humble down to earth nature, and the need to make sure that everyone is safe and happy. The most important thing to remember is to be open as possible, I understand people are anxious and can be stressed during a reading, but being open allows the reader to connect better to your energy and the situation that is happening around you, a few deep breaths works wonders. An open mind is very important, you are in charge of your own life, only you can change what is ahead for you. She is lovely, positive and very easy to talk to. She’s given me hope and confirmed my own thoughts. I’d definitely recommend a reading with her. Thank you Sara thank you ???????? thank you ???? Good reading. Recommended reader. Very much worth calling. I had a really special reading with Sara tonight . I was initially feeling very unhappy and disheartened. Sara spoke a truth, that I could really feel. I am a healer and Reiki master, and I very quickly feel the truth and validity of another clairvoyant. Thank you so much Sara A. I hope to speak to you again, another time. Carol. Leave feedback for "Sara A".